Sen. James Inhofe (R-Okla.), the Ranking Member of the Environment and Public Works Committee, delivered a startling and historic two hour speech on the Senate floor Friday about "recent developments which are turning 2007 into a ‘tipping point' for climate alarmism." The Senator cautioned that bills being proposed by various members of Congress "come at a time when the science is overwhelmingly taking away the basis for alarm." These "so-called ‘solutions' to global warming...will have no measurable impact on the climate," and "will create huge economic harm for American families and the poor residents of the developing world who may see development hindered by unfounded climate fears." We are currently witnessing an international awakening of scientists who are speaking out in opposition to former Vice President Al Gore, the United Nations, the Hollywood elitists and the media-driven "consensus" on man-made global warming. We have witnessed Antarctic ice GROW to record levels since satellite monitoring began in the 1970's. We have witnessed NASA temperature data errors that have made 1934 -- not 1998 -- the hottest year on record in the U.S. We have seen global averages temperatures flat line since 1998 and the Southern Hemisphere cool in recent years. These new developments in just the last six months are but a sample of the new information coming out that continues to debunk climate alarm. In conclusion, I would simply point out that climate alarmism has become a cottage industry in this country and many others, but a growing number of scientists and the general public are coming around to the idea that climate change is natural and that there is no reason for alarm. It is time to stop pretending that the world around us is headed for certain doom and that Kyoto-style policies will save us - when in fact, the biggest danger lies in these policies themselves. As I have noted, new studies continue to pile up debunking alarm and debunking the very foundation for so called "solutions" to warming. I know this was a long, long speech, but I just want the real people, not the money driven liberals and the Hollywood elitists, but the real people who are out there raising their families and working hard to know that help is on its way and that all the UN and media driven hype to sell American down the river will fail. And that truth, as Winston Churchill said, "is incontrovertible, ignorance can deride it, panic may resent it, malice may destroy it, but there it is." 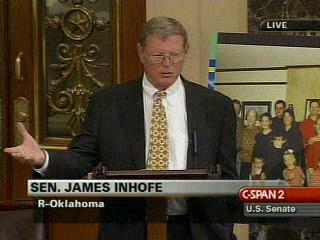 Those interested should read Inhofe's entire address available here.